On the example of steels 20L, 45L and U7L the opportunity of toughness increasing in the castings up to the level of wrought steels with similar chemical composition through the use of intensive heat removal during crystallization is shown. It is established that highly dispersed cast structure of rapidly cooled steels facilitates the implementation of more energy-consuming mechanisms of failure. Key words: steel, casting, crystallization, failure, fracture. Breaks of castings a frame lateral from steel 20GFL in the course of impact on them cyclic loading of freight cars are considered at movement. Embrittlement of the lamellar carbides which were formed in steel of manganese with loss of durability of metal of casting is established. 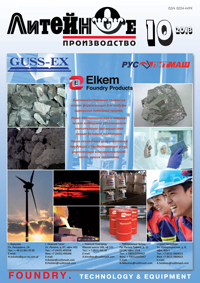 It is offered to lower the content of manganese in steel with nickel and titan introduction for increase of the general durability, plasticity and a hladnostoykost. Data of strength properties of steel 20NTL by results of production of castings on Rubtsovsk Altayvagon branch of JSC are provided. Keywords: technology, manganese carbide, break, system approach, analysis of defects, nickel, titan, logical inspection, steel, temperature, normalization, high-temperature holiday, casting, quality. There have been obtained results on the influence of charge billets on the density of Al13%Si melts in a wide range of temperatures. It was found that the density polythermshave extrema in the form of maxima at melt overheats to 950…1000°C. Differences in melt density change depending on the structure of initial charge billets were established. Key words: structure, structure-sensitive properties of melts, hereditary influence. In furantechnologies, they use low-condition reclaimed sand with 1.3% C and more. The actual reclaimed sand yield is75…80%. The main criterion of necessity of using chromite facing of molds and cores is the casting wall thickness. Washing allows to produce penetration-free steel castings with a wall thickness up to 70 mm. Key words: furan technologies, cold-hardening sand molds, spent sand, reclaimed sand, carbon in reclaimed sand, casting wall thicknesses, penetration, chromite sand, staurolite. The results of the effect of molding characteristics of quartz sand on the strength of the core were shown. Recommendations on the choice of sand, in accordance with the requirements of the process were given. Key words: foundry quartz sand, tensile strength of sand mixture, cores, binders. In the given paper the decision of reduction of deterioration of the lobe the device by means of simulation of its optimum shape, by drawing up of a program complex for shape optimisation is offered. Key words: the drobemyotnyj device, lobes, deterioration, the program, simulation, a scatter, fraction, blow. It is shown a centrifugal casting of composite materials (CM) for achieving a gradient structure. Also its shown particles reinforced effect at hardness of CM. Keywords : aluminum, boron carbide, centrifugal casting, composites, gradient materials, silicon carbide. The article is devoted to the development of technology of large workpieces up to 160 mm diameter discs at the turbine turbine engine from heat-resistant nickel alloy VZH175 by directional solidification on the installation UVNK-10. The possibility of using directional solidification process for the manufacture of circular blanks. Obtained experimental batch of blanks with directional structure. Key words: installation of directional solidification, heat-resistant wrought alloys, ceramic mold. In the study of heat transfer between the casting and mold experimentally determined rate of cooling cylindrical casting located within the evacuated mold sand, in the forced cooling casting gaseous, liquid refrigerant evacuation and movement of sand particles on the basis of which a number of ways designed accelerated cooling of the casting. Examples of the use of these methods for casting hulls cylinder blocks are shown. Keywords : sand mold, heat transfer, V-Process, Lost Foam Casting, casting cooling, refrigerant.